My husband and I love granola and until a few years ago, we were buying store bought versions. However, we noticed sometimes these packaged products came with a long ingredient list, often had a lot more oil/sugar added including sweetened dried fruits and were not very cheap either. So I tried to make a homemade healthier version which worked so well I have been making it ever since. Here’s the vegan, egg-free, dairy-free and gluten-free (if using gluten-free oats) granola recipe below…it’s really easy! An easy vegan, egg-free, dairy-free and gluten-free homemade granola recipe. Great for snacking on by itself or as part of a trail mix, or to use for breakfast in the morning. 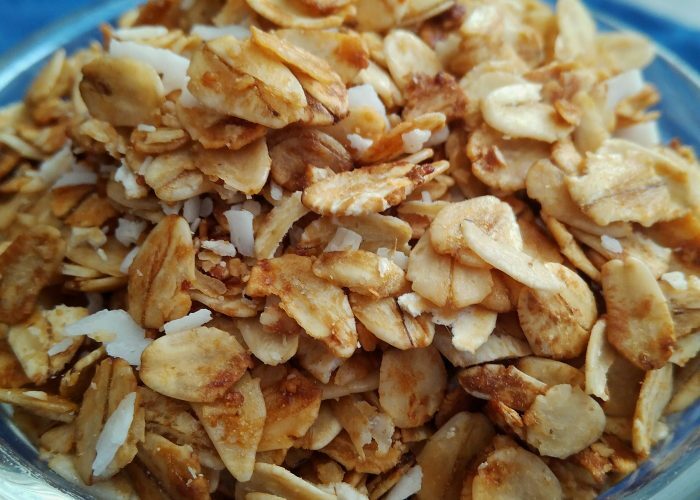 Mix coconut flakes and oats in a wide bottomed pan (this will cause the coconut flakes to get toasted in the process of baking the granola). If you like you can also add in nuts and seeds at this point. Heat honey and oil in a small saucepan and bring to a boil for one minute. Then remove from the heat and stir in the almond extract (optional). Pour the honey-oil mixture over the oat mixture and stir until coated. Let the granola cool completely before adding in chopped dried fruit. If you are going to measure out honey in a measuring cup, measure out oil into the cup first, then use the same cup to measure the honey. The honey will slide out like magic. Less mess! Also, you can choose instead to add in the coconut flakes, nuts, seeds and dried fruit at the end after the granola is out of the oven and has cooled down. Note that if you can’t get plain dried coconut flakes you can use the sweetened version. You can also leave the coconut flakes out if you prefer. This homemade granola won’t have the clusters you see in store bought versions since less oil/sugar is used, but it tastes just as good. Of course, you can adjust the amount of oil/sugar you like according to your preference, and try variations by adding in different dried fruits, nuts, seeds. We make a big batch each time and just freeze portions. Enjoy or give away as edible gifts! ← Arsenic & Rice (Part 3): What Are Others Saying About It?